Please check for ongoing Updates HERE and at @svdebug and @CURYJ on Twitter and Facebook. 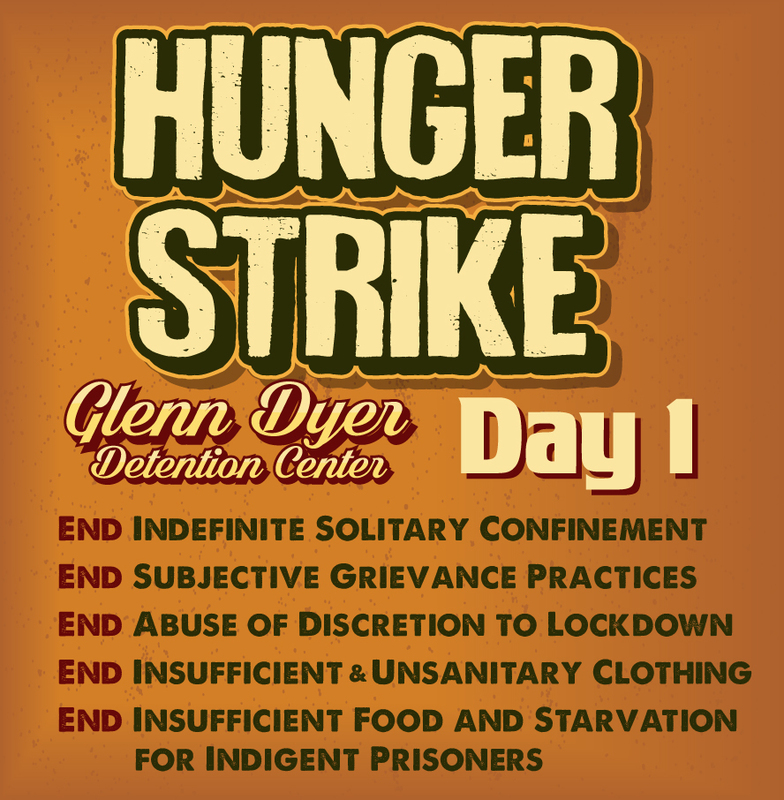 PRISONERS UNITED in Alameda and Santa Clara County Jails are being deprived of their human and constitutional rights of due process and inflicted with cruel and unusual punishment, inhumane living conditions, and the torturous practice of solitary confinement..
Today, October 15, 2017, PRISONERS UNITED in Glenn Dyer Detention Center courageously lead the way in a Hunger Strike that will span across 2 counties and 4 jails. Santa Rita Jail, Santa Clara County Main Jail and Elmwood D.O.C. will continue the strike in solidarity on October 22. End Indefinite Solitary Confinement/Administrative Segregation. End Abuse of Discretion to Lockdown Unstructured Programming (Time Out of Cell). End Insufficient and Unsanitary Clothing. End Insufficient Food and Starvation for Indigent Prisoners. Post these fliers on social media. Court’s full decision at the bottom of the post. A state appeals court says a California prisoner who took part in a mass hunger strike protesting long-term solitary confinement should not have been punished for disorderly behavior because he did not disrupt prison operations or endanger anyone. 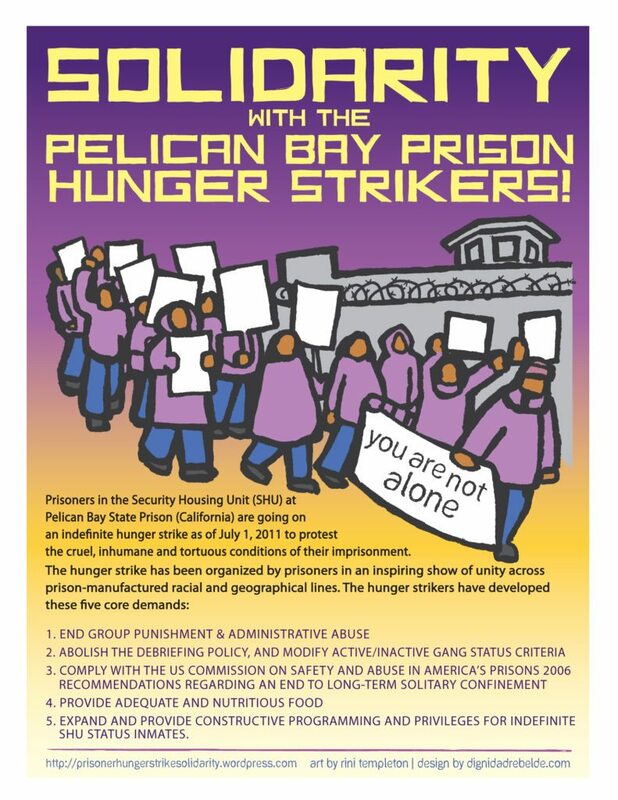 Although the 2013 hunger strike, which involved as many as 30,000 inmates across the state, may have affected the workload of prison staff members, there was no evidence of “a breakdown of order” or any threat of violence, the First District Court of Appeal in San Francisco said in the case of a former inmate at Pelican Bay State Prison. The ruling, issued last month, was published Friday as a precedent for future cases. In addition to overturning a 90-day sentencing increase for the inmate, the decision could help numerous hunger strikers whose prison conduct is scrutinized by parole boards, said an attorney in the case, Carol Strickman of Legal Services for Prisoners with Children. For inmates serving life sentences with the possibility of parole, “the parole board is citing the hunger strike as a reason to keep them in prison, because of their ongoing criminal mentality,” Strickman said. The inmate, Jorge Gomez, was sent to Pelican Bay, in Del Norte County, in 2000 and was transferred three years later to the prison’s Security Housing Unit, where he was kept in solitary confinement for more than a decade. In July 2013, he refused to eat for four days and, after the third day, was cited for a “serious” violation of prison rules for taking part in a hunger strike. 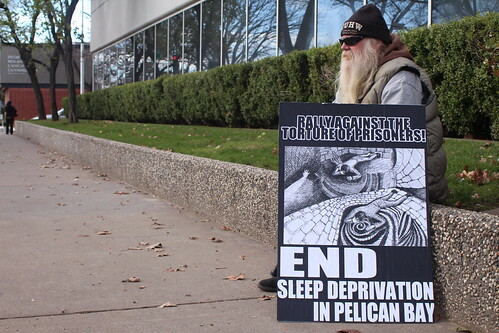 On February 1, 2016, people from all over California gathered in Sacramento at the headquarters of the CA Department of Corrections and Rehabilitation (CDCr) to demand an end to the dangerous and deliberate sleep deprivation being inflicted on the people in solitary in Pelican Bay State Prison SHU, under the guise of “welfare checks”. Before the Rally, more than 15 formerly incarcerated people, family members, pen pals, and other activists visited the offices of Loni Hancock (chair of the CA Senate Public Safety Senate Committee), Bill Quirk (chair of the CA Assembly Public Safety Committee), and reps from various districts to demand the immediate suspension of the sleep deprivation “welfare checks” in the Pelican Bay SHU. Sleep Deprivation Is Torture. Reportbacks below are from Martha Esquivel of San Diego, CA and James Decker of Eureka, CA. Photos are from Liberated Lens Collective, Lucas Guilkey, James Decker, and Urszula Frydman. Please inquire about photo accreditation before using unlabeled photos. I’m so very thankful for having the opportunity to go to Sacramento and stand up with you all in front of CDCr and show them our unity, meet new people and listen to their stories… about how their loved ones are being tortured by CDCr, our employees. Yes, our employees. Because they get paid with our taxes, and instead of rehabilitating our loved ones who make mistakes, they are looking for methods to keep the torture going one way or another. 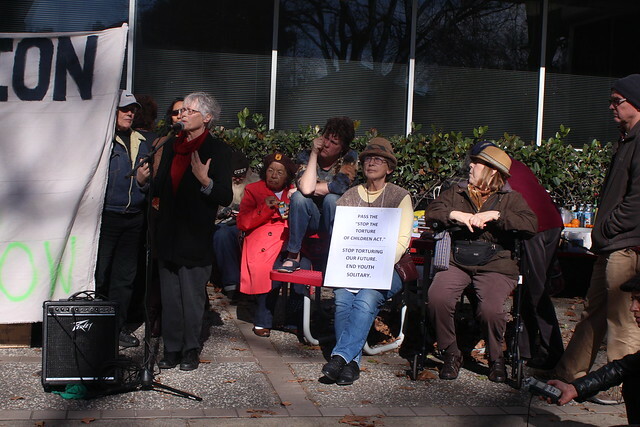 Almost 5 years ago, we were standing outside CDCr demanding CDCr stop the torture of our loved ones in Indefinite Isolation. We proved to them that was torture. We Won and now CDCr has found another way of torturing them, by not letting them sleep. It has been 6 months of sleep deprivation and they know that it is torture. Back in 2011, we didn’t have a clue what to do, we only knew that our loved ones were being Tortured and they needed our support. Our loved ones pushed from the inside and we pushed from the outside, and we got the Victory. Today, we are more people fighting for our loved ones in prison. Some of them are out of the SHU, but we are still here fighting for the one’s still in the SHU. We are not leaving anyone behind. Together We know We can make a change, and we just want to let CDCr know that regarding this new chapter of torture they have created: We are going to win too, because our movement is a movement of Love, and we believe in rehabilitating humans not destroying them! 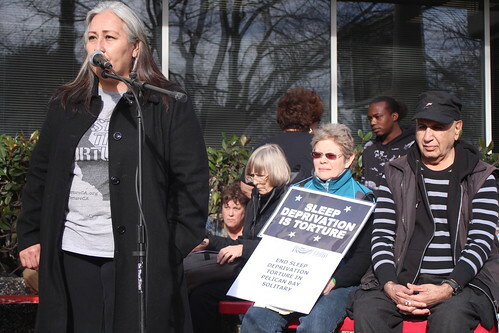 Martha Esquivel is active in California Families Against Solitary Confinement and the Prisoner Hunger Strike Solidarity Coalition; She is sister to Luis Esquivel, a named Plaintiff in Ashker v Brown, now out of Pelican Bay SHU after 15 years in solitary there. I was proud to be part of the contingent from far northern California to attend the Rally Against the Torture of Prisoners on February 1, 2016. We gathered just after noon, a group of family members, formerly incarcerated persons, activists, attorneys, and faith leaders. Diverse members of the community gathering with a single purpose: to stop the sleep deprivation torture. I was moved by the testimony of those folks fighting for the very lives of their loved ones. More then 70 people were there to listen and demand action! Women, mostly women of color, spoke about a racist system fueled by capitalism that has devastated their families and robbed their communities. Thanks to the folks that helped create these powerful posters and the Artist Richard Torres. Cynthia spoke of the callous neglect and medical malpractice that is rampant in the prison system. It resulted in the death of her brother. We must keep the pressure up to end this abominable behavior by the Department of Corrections and the State of California. James Decker works with Peoples’ Action for Rights and Community and the Prisoner Hunger Strike Solidarity Coalition. As of February 1st, it will be 181 days that the men in Pelican Bay SHU have been tortured by sleep deprivation. For six months the men have been awakened every 30 minutes, 48 times per day, due to so-called “security/welfare checks” by guards. Join us in Sacramento on February 1st, 2016 at 1:00 pm to rally against the torture of prisoners! Come and stand with us to put an end to torturous ‘welfare checks’ in the SHU. RIDESHARES will be leaving from Southern California, Santa Cruz, the SF Bay Area, the North Coast, and locations in between. PHSS will help with travel expenses. Please contact phssreachingout@gmail.com, 510-426-5322 if you need or can provide a ride. 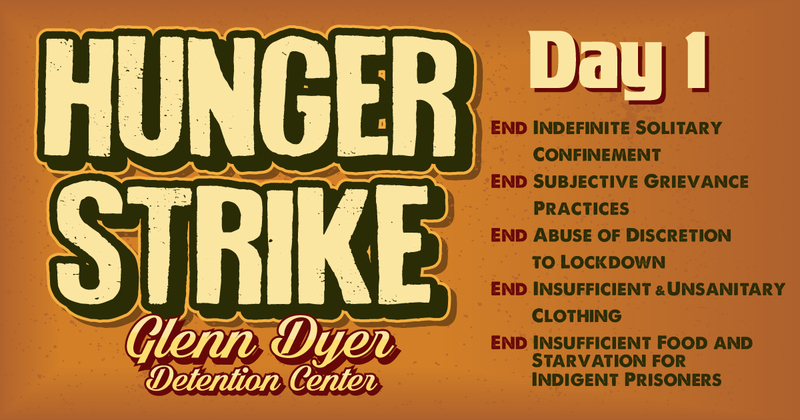 You can also message Prisoner Hunger Strike Solidarity on Facebook. We need to make the Senate and Assembly Public Safety Committees and Governor Brown stop this now! We must keep the pressure on! Following the historic gains made against solitary confinement in August, prisoners in Pelican Bay State Prison’s SHU report the use of “welfare” or “suicide” checks occurring every thirty minutes, 48 times a day. The checks are being conducted in an aggressive way and prevent people from sleeping for over thirty minutes at a time. Loud stomping, the slamming of doors, the striking of electronic wands against buttons installed by cell doors, and the shining of lights into prisoners’ faces are routine. Deprivation of sleep is widely seen as a form of torture. Additionally, a national effort “Together to End Solitary,” will be launching its website tomorrow in coordination with the monthly actions on the 23rd, www.togethertoendsolitary.org. 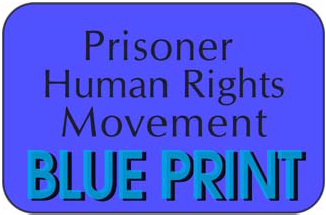 PHSS is a statewide coalition that includes California Families Against Solitary Confinement, Legal Services for Prisoners with Children, Critical Resistance, California Prison Focus, American Friends Service Committee, and many other organizations and individuals who work against imprisonment and solitary confinement. Also, on October 23rd, groups nationwide introduce the Together to End Solitary campaign! 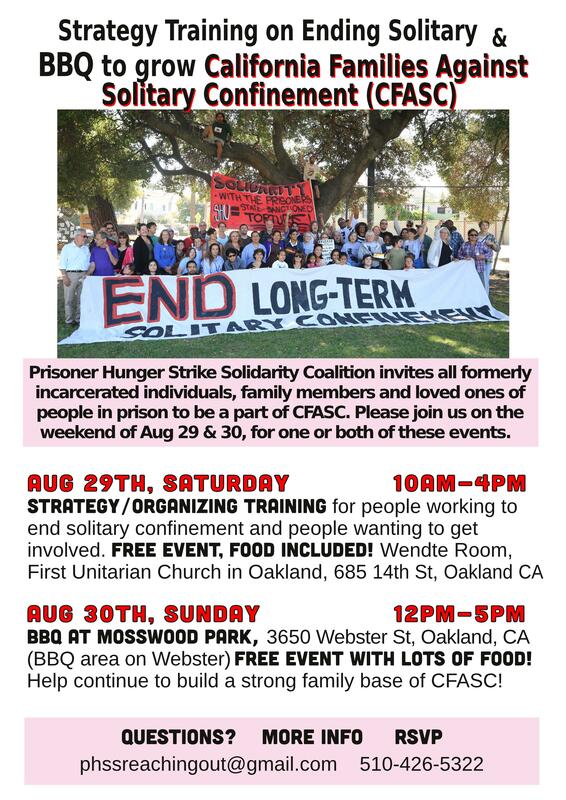 Prisoner Hunger Strike Solidarity Coalition (PHSS) invites all family members, loved ones and formerly incarcerated individuals to a workshop on Sat, Aug 29th, and a BBQ to grow California Families Against Solitary Confinement (CFASC) on Sun, Aug 30th. Please post/share this weekend of events, allies also welcome! PHSS Strategy Training on Ending Solitary, sponsored by American Friends Service Committee. The training will expand on Michelle Alexander’s call to action in “The New Jim Crow” to dismantle the largest penal system in the world. BBQ at Mosswood Park to grow California Families Against Solitary Confinement (CFASC). We hope this BBQ gathering will help family members and loved ones of people in prison and formerly incarcerated individuals continue to build a strong family base of CFASC members. Gathering under the oak trees. Eat, meet, relax, enjoy.